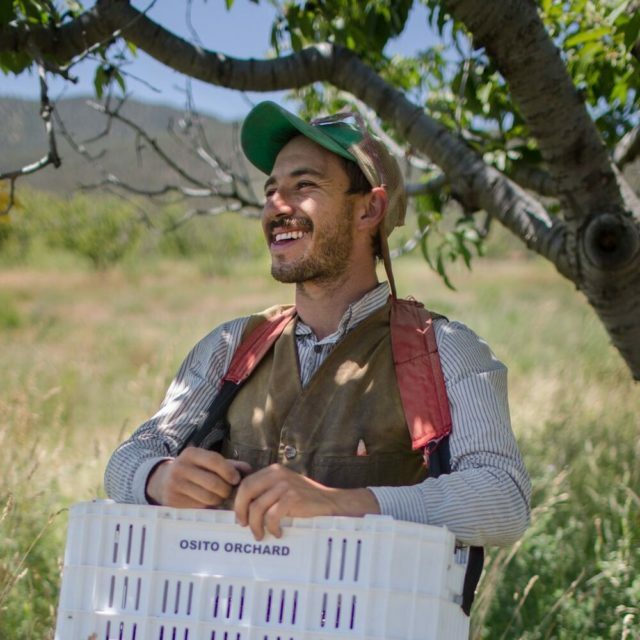 The western slope of Colorado is known for its peaches, so when Harrison Topp returned to the Rockies after years of farming vegetables in North Carolina, it’s no surprise that he was happy to start restoring 15 acres of older stone fruit trees on his family’s land in Paonia, CO. That first year, 2013, was a successful one, but the next brought a dreaded late-season frost that took out the entire crop. Topp continued to maintain the orchard and care for the trees, knowing that they wouldn’t provide an income that year. After a successful following year, he felt sure that he’d need crop insurance to build the business and avoid future losses. Stacia Cannon joined Topp Fruits in 2014, and while the couple lived an hour from the orchard they began a search for a larger parcel. They both worked off-farm jobs–Cannon with a vet and sheep ranch and Topp as the Director of Membership at the Rocky Mountain Farmers Union. 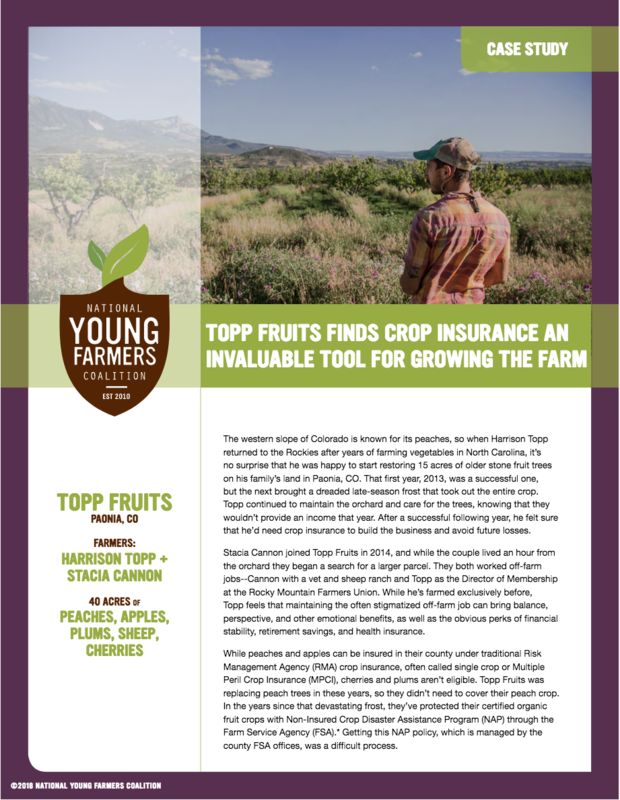 While he’s farmed exclusively before, Topp feels that maintaining the often stigmatized off-farm job can bring balance, perspective, and other emotional benefits, as well as the obvious perks of financial stability, retirement savings, and health insurance. While peaches and apples can be insured in their county under traditional Risk Management Agency (RMA) crop insurance, often called single crop or Multiple Peril Crop Insurance (MPCI), cherries and plums aren’t eligible. Topp Fruits was replacing peach trees in these years, so they didn’t need to cover their peach crop. In the years since that devastating frost, they’ve protected their certified organic fruit crops with Non-Insured Crop Disaster Assistance Program (NAP) through the Farm Service Agency (FSA). * Getting this NAP policy, which is managed by the county FSA offices, was a difficult process. The application was obtuse. Topp says, “My mother, a retired attorney, has a high degree of proficiency with paperwork and even she struggled to understand the forms. This was frightening because it was make or break for us. We had a total loss last year, and we needed NAP coverage. We felt like if we got anything on the application wrong, it was a big deal…FSA didn’t always know the answers.. But, just as with everything, endurance and building a relationship with FSA was the solution. Not being afraid to call them and ask questions or push to speak with supervisors. So ultimately, we just needed the resolve to push to get clear answers in order to complete the application correctly.” In the years that they have used NAP, Topp Fruits has gotten a payout. Topp Fruits has applied for traditional multi peril insurance for 2019, but will need to continue to cover cherries and plums with NAP. The process of applying for the traditional single crop or MPCI has thus far been easier, in part because of the knowledgeable independent crop insurance agent they worked with. Topp Fruits found the RMA and NAP options to be very reasonably priced. 2016 was a bumper year for stone fruit in Colorado, and while some people might think that would make for a wonderful season, tons of perfect fruit flooded the market, and the price per box plummeted. While NAP doesn’t cover revenue losses, RMA’s Whole Farm Revenue Protection (WFRP), newly rolled out in 2015, covers revenue losses due to many causes, and is geared toward diversified growers. Topp sees other growers shifting to WFRP in his area and believes that Topp Fruits will choose this option when they have enough seasons of records to qualify. Under this program, they could also insure revenue from the sheep enterprise they’re incorporating. However, he notes that with MCPI, they can choose to use their county averages if those are better than the farm’s own historical yield data. In 2018, with a loan from FSA, Cannon and Topp bought a 25 acre farm and formed an LLC with family to manage some of their farm operations. This new land also includes a place to live and, with the 15 acres they already manage, they have adequate permanent acreage for their business. The process of applying for the loan was more straightforward than applying for NAP, yet they were thankful for their experience with farm safety net programs. Having crop insurance added to their comfort with taking out a significant mortgage, as did their off-farm income and diversification of enterprises. Additionally, FSA required them to use conventional commodity crop prices to prove their income, instead of the higher organic premiums they usually get. Even based on the lower conventional prices, they are still very close to being able to pay the mortgage using farm income. This more conservative or pessimistic business plan allows them feel that, even with a terrible year, they’ll still be able to pay the mortgage. *Yes, I know. There are a lot of acronyms in this paragraph!